All proceeds from the concert, which takes place at St Michael's Church, Heavitree, from 7:30pm on Wednesday 1 May, will go directly to WaterAid projects in countries like Zambia, helping some of the country's poorest communities gain access to clean water, decent toilets and good hygiene. The concert will feature school ensembles including Symphony Orchestra, Chamber Orchestra, Chamber Choir, Vocal Ensemble, Belles Canto, Barbershop Boys, Jazz Band 1, Senior Brass and the Saxophone Quartet and will feature movements from Haydn's 88th Symphony, Bizet's Carmen Suite, "Winter", the violin concerto from Vivaldi's famous "Four Seasons" and Bruch's Violin Concerto and choral pieces by Stanford, Rutter and Whitacre and chamber pieces by Haydn, Thad Jones and Thelonious Monk amongst others. The Symphony Orchestra will play the most famous movements of Bizet's Carmen Suite, including the lively "Aragonaise", the lyrical "Intermezzo", the "Dragons d'Alcala" interlude, which will feature a number of soloists from the woodwind section, and the famous, rousing "Toreadors". The orchestra will also perform the slow movement of Bruch's Violin Concerto (with a solo by Upper Sixth Former Georgia Ling). In the words of Joseph Joachim (1831-1907):"The Germans have four violin concertos. The greatest, most uncompromising is Beethoven's. The one by Brahms vies with it in seriousness. The most inward, the heart's jewel, is Mendelssohn's, but the richest, the most seductive, was written by Max Bruch." The Chamber Orchestra will perform the last movement of the little known 88th Symphony by Haydn. A "perpetual-motion finale," it is considered one of the most cheerful Haydn ever wrote. "Winter" will feature three violinists, Upper Sixth Formers Oliver Bates and George Guthrie, and Louis Solon from the Lower Fifth. The Concert Orchestra, made up of Middle School pupils, will perform an arrangement of Mancini's "Pink Panther" and finish with the Latin rhythms of "Fiesta Tropicale". 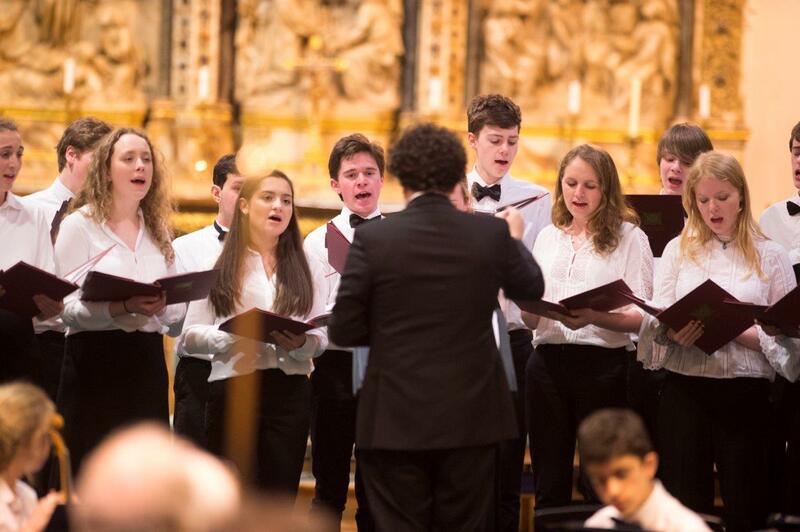 The Chamber Choir, a 40-strong senior ensemble, will perform a selection of shorter pieces including Rutter's "The Lord Bless You and Keep You", Duruflé's "Ubi Caritas", Grayston Ives's "Listen Sweet Dove" and Stanford's "Beati Quorum Via". The lighter side of the evening's choral music will be provided by the 16-member Vocal Ensemble (Whitacre's "Sleep" and "The Bare Necessities"), the Belles Canto ("California Dreaming" "Super Trooper") and the Barbershop Boys ("I am a Man of Constant Sorrow"). If Jazz is more your thing then your needs will be provided for by Jazz Band 1 performing Thad Jones's "Big Dipper" and Thelonious Monk's "Blue Monk". "WaterAid believes in a world where everyone everywhere can gain access to clean water, decent toilets and good hygiene. Thanks to the support the Headmaster, staff and students at Exeter School have given us over the last 17 years, we can make a far bigger impact, reaching even more people, and transforming lives for good." "None of us at the concert have to worry about running water for ourselves today, this week, or this month, and through participating with WaterAid I hope that the children involved will be inspired to make a change for those without fresh water sometime in the future." Tickets are available at the door or online from Exeter School's Box Office athttp://www.exeterschool.org.uk/box-office (tel: 01392-258712).